Are you tired of paying high prices for auto parts? The biggest challenge isn’t finding a quality part for a low price. The answer to your problem is not cut-rate imitation parts that break after a few thousand miles. What you need are quality tested used auto parts that sell for a fraction of the price. Uneedapart specializes in locating used car parts for all makes and models from your reliable truck to your prized sports car. With our help, you can enjoy OEM parts that feature an excellent combination of high quality with low prices. We make finding the right parts easy. We have a convenient search engine that allows you to look for specific parts or systems. All you have to do is enter the part you are looking for along with details about your car like make, model and year. The system will do the rest of the work for you. Uneedapart.com takes pride in providing you with the great used auto parts that you need. Whether you have an older foreign car or a newer domestic car, we search salvage yards all around North America and Canada to help you find the right engine, assemblies and other hard to find parts. You will be provided with several options to choose from, and they will all be a great match for your car. We know that you are looking for hard to find parts for your Mustang or affordable OEM replacement items for the Thunderbird in your garage. We also appreciate that you’re trying to save money in the process. We locate the part directly from the yard to eliminate the middleman and save you money. Other used parts companies obtain the parts and then mark them up by as much as 90 percent. We help you to find the parts you need without getting stuck with ugly fees and high markups. With our service, you can find several options to choose from. You can select the price range, mileage information and conditions you are looking for. 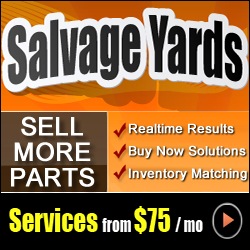 Once you have found the perfect part from our incredible nationwide network of salvage yards, you will discover that the prices are as impressive as the service. We can bring you the lowest prices because our used parts suppliers want your business. It’s an open market system where they are forced to compete with each other to give you the best prices and options. You can find the lowest costs and best options without any haggling or negotiating. When you want quality used auto parts for your car, you don’t have to pay high prices that leave you struggling financially. We are not paid through your purchase, so you can rest easy knowing that you are getting the best price for the parts you need. When you have a car that’s nearly paid for, you don’t want to go out and buy a new one because the transmission failed or the engine is blown. It’s more affordable to buy a used engine or transmission and put it in place. We have the ultimate network of yards for finding high quality parts like these. In fact, engines and transmissions are one of our most popular options. Are you trying to find the perfect engine for a 1973 Camaro you’re restoring? Maybe you just want an engine with low miles for the family minivan. Whether you’re trying to save a few dollars or find something rare, we can help you. Our recyclers are happy to provide warranties on most parts, so you can buy with confidence. It doesn’t matter if you’re looking for a high performance masterpiece or a powerful workhorse to increase towing capacity. Uneedapart will help you find a perfect match at a price you can live with. The fact is that OEM parts are more reliable than poor-quality after-market options, and used parts may be the only option when you are dealing with older models that are out of production. Those specialized parts that are hard to find could cost a small fortune through other dealers, but we can help you save money. We search all over the country to help you find the factory parts you need for that restoration project or standard repair. We will do everything in our power to help you find that used part that perfectly matches your specifications. The price will be attractive because of the friendly competition between suppliers, and you will have the exact item you need at a price you can afford. It doesn’t matter if you are looking for parts for a hybrid, diesel or a specialty engine; we will help you find the right items. When you work with online used parts locating companies, you want to choose a name you can trust. We know that the same parts are often used on different cars and years, and that knowledge also helps us save you money. We never charge any fees, service charges or even restocking charges. It’s all part of our dedication to customer service and your satisfaction. We are here to help you save money, and that means offering you low, transparent prices without any surprises. Whether you are looking for Mazda parts or a replacement transmission for your Nissan, we can help you. All used parts dealers offer fast and convenient shipping along with great prices. Use our service today to see if we can help you find the parts you have been searching for. We’ll even help you save some cash in the process.